How Can I Get a Diploma Without Passing My OGT Tests? How Long Does the PERT College Test Usually Take? What Are the Scores Needed to Pass the CRCT? What Are the PSSA Standardized Tests? Students enrolled in Pennsylvania public and charter schools are required to take the PSSA tests. The PSSA (Pennsylvania System of School Assessment) describes a paper and pencil evaluation given to students, third through eighth and 11th grades, enrolled in a government-funded school in Pennsylvania. The test reveals cumulative and individual scores that determine progress by students, teachers, schools and districts statewide. These tests are comprised of assessments in reading, writing, math and science, and the scores are used to locate those needing additional support and resources. Who is Required to Take the Test? Students in third through eighth and 11th grades enrolled in state- and government-funded schools within Pennsylvania are required to take the annual PSSA tests. Tuition-based schools are not required to administer these tests, although some do for research purposes. The department of education requires that at least 95 percent of all students are given the assessments. The Pennsylvania System of School Assessment tests include sections of reading, writing, math and science. The eighth- and 11th-grade students are administered all tests in the four subject areas, while students in grades three through seven are required only to be tested in reading and math. Additionally, science tests are administered to children in fourth grade and fifth graders take the writing exam as well. How are the Scores From the PSSA Used? "School Improvement" is a status used for schools that have not met the minimum proficiency requirements set by the federal government two years running. The AYP statistics, or Adequate Yearly Progress stats set by the No Child Left Behind Act of 2001, state that at least 56 percent of students must be proficient in math while 63 percent of test takers must reach the proficient level in reading. Individual scores are sent to the school as well as the parent or guardian to find any need for curriculum adaptation and added support. 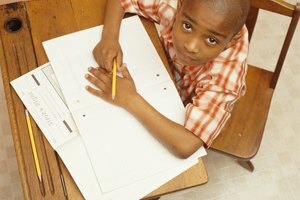 From February to the end of March, various PSSA tests are given to the students in Pennsylvania public schools. Instructors prepare the students by doing practice problems, reviewing testing procedures and incorporating anti-anxiety activities. Encourage academic advancement through the entire school year to avoid cramming for exams, which allows the students to feel more at ease during test time. Suggest that the child gets adequate rest and eats a well-balanced breakfast before being administered the assessment to get the child off on the right foot. What Is the Purpose of a School Improvement Plan? 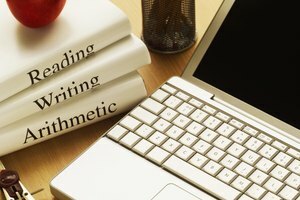 What Is the Difference Between the Kaplan SAT, ACT & PSAT? What Is the Highest Score on the Praxis II? Dawe, Trisha. "What Are the PSSA Standardized Tests?" Synonym, https://classroom.synonym.com/pssa-standardized-tests-7837064.html. Accessed 21 April 2019.